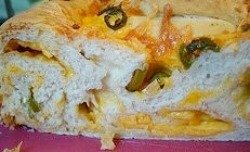 I have more than just a jalapeno cheese bread recipe, check out more bread recipes at the bottom of the page. You will adore this homemade jalapeno cheese bread. Loaded with flavor, this bread makes perfect sandwiches, grilled cheese and anything else your heart desires. 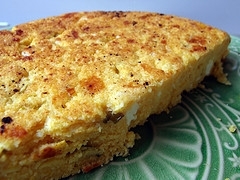 Also offering a delicious moist jalapeno cheese cornbread recipe. Proof yeast in the warm water with 1 teaspoon of sugar for 10 minutes – or until foamy. Meanwhile, heat the milk in the microwave for 50 seconds on high. In a large stainless steel bowl, add the 4 cups of flour, jalapenos, salt, sugar, egg, hot sauce and warmed milk. After the yeast has proofed, add mixture to the bowl and start kneading dough mixture. Continue to knead the bread dough for 8 to 10 minutes on a lightly floured surface adding flour as needed to create smooth, semi-sticky dough. Just before you are done, add the cheese cubes and mix in. Cover with a kitchen towel and let rest for 10 minutes or so. Knead for 30 seconds and place in a well greased bowl and let rise until doubled in size. Punch dough down and cut in half. Place in greased bread pans, cover with a towel and let rise again until doubled in size. Brush tops with egg white mixed with a little water and sprinkle with sesame seeds or parmesan cheese. Bake for 25 to 35 minutes or until the crust is dark golden brown. You may add a little shredded cheddar cheese on top during the last 10 minutes of baking. To quickly bring an chilled egg to room temperature, just place egg in a cup of hot water for 8 to 10 minutes. Shape into a French loaf and make garlic bread out of this. Yum, is all I can say. Excellent cornbread. Great with chili or soup too. Stir first 3 ingredients together in a mixing bowl. Add corn, eggs, bacon drippings and milk. Stir lightly until mixed and dry ingredients are just moistened (don't over-stir). Pour half of the batter into the prepared baking pan. Combine the cheese, onion and jalapenos and sprinkle over the batter. Top with remaining batter and bake for 45 minutes or until toothpick inserted in the center comes out clean.